Giro d'Italia 2017 will be the race's 100th edition, a historic milestone that will start from Sardinia for the third time in its long history. The Big Start of the Corsa Rosa – organised by RCS Sport/La Gazzetta dello Sport from Friday 5 to Sunday 28 May – was unveiled this morning in Milan. 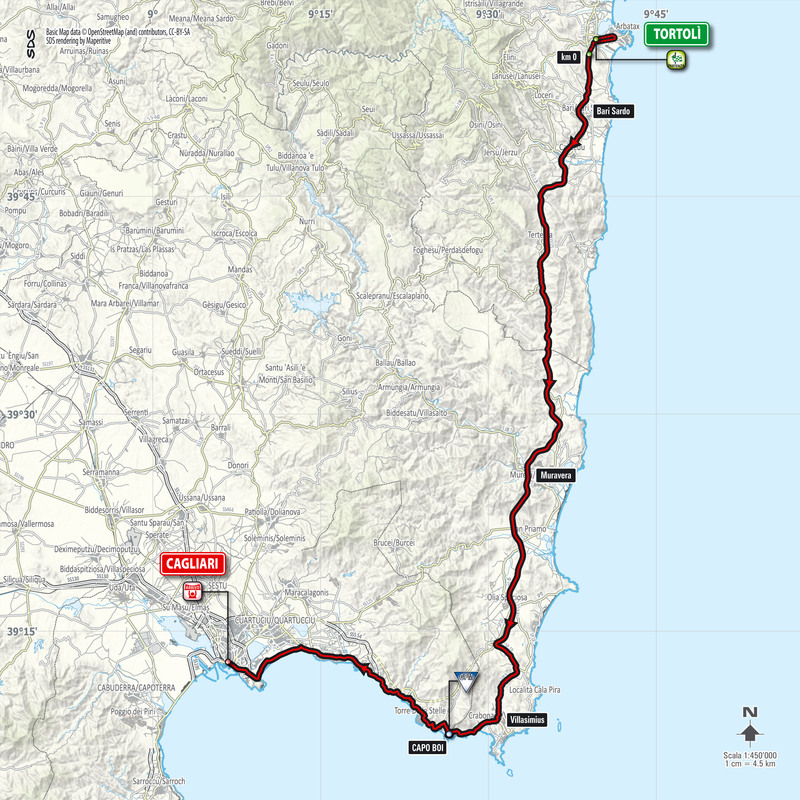 The race will include three in line stages on the island: Alghero-Olbia (203km), Olbia-Tortolì (208km) and Tortolì-Cagliari (148km). The 2017 edition will mark the 88th Big Start of the race from within Italy, 12 starts having been made from abroad. The first time Giro d'Italia was raced in Sardinia was in 1961; an occasion that marked the 100th anniversary of the birth of the Italian kingdom. The Corsa Rosa, which started in Turin, arrived on the island for Stage 4, Cagliari-Cagliari, won by Oreste Magni. That edition of the Giro, which ended in Milan, was won by Arnaldo Pambianco. Thirty years later, in 1991, the island saw its first Big Start, with two in line stages and two semi-stages, one of which was a time trial. Franco Chioccioli won that year's Giro. The Giro d'Italia's 90th edition started in Sardinia with the spectacular Caprera-Maddalena Team Time Trial and the unforgettable Teams Presentation on the Italian aircraft carrier Giuseppe Garibaldi. After 10 years away the Corsa Rosa returns its roads on the island. 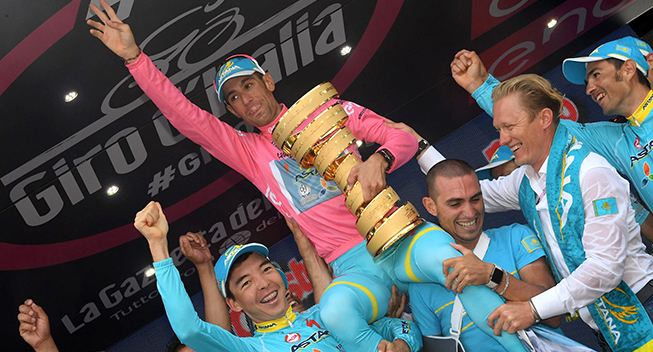 Fabio Aru, Sardinian professional cyclist, said: "Since I've heard the rumours about a Giro Big Start in my Region I've always hoped it was really going to happen. Being here today it's a great feeling and makes me really proud: I'm sure there has been a lot of other decisive factors but even being able to think that my success on a bike could be a positive contribution for making this Big Start happen makes me very happy. On top of that, thinking that this is going to be the 100th Giro d'Italia, I couldn't ask for more. I hope that this important event will kickstart in Sardinia a competitive cycling movement able to organise many races at all age levels, allowing young riders to grow. I will make my next year's racing programs with our sport directors at the end of November, but I can certainly say that I wouldn't like to miss a Giro that starts in my Sardinia for anything in the world!" RCS MediaGroup Chairman and CEO, Urbano Cairo, said: "I'm proud to contribute to the emotion of the Giro d’Italia, which I’ve been passionate about since I was a child, when I followed my hero, Felice Gimondi. The Giro is in our DNA, a national treasure that we want to valorise at the highest possible level. We will start from Sardinia, one of our country’s most beautiful regions, and I'm sure that the 100th edition will be truly special. My intention is to grow the Giro d’Italia more and more and take it to the maximum level. We will make important investments along with our partners and everyone who will be part of the future Giro family, be they media, sponsors or political institutions." Paolo Bellino, RCS Sport Managing Director, said: "It's an honour for me being here with you today to launch a historic edition of the Giro d’Italia, the 100th, that I'm certain will be unique. This is an event which is not only part of the sport scenery but it's part of the cultural and social history of our country. The Big Start from Sardinia will be spectacular thanks to a unique territory, a truly incomparable setting that will host us. The Giro d’Italia is the main event of RCS Group and its prestige and value, both nationally and internationally, keeps growing year on year. This is shown by the number of fans in 194 countries across the five continents attract media, sponsors and local institutions such as the one here with us today and that I would like to thank. We're proud to represent Italian excellence to the world." The Region of Sardinia's Head of Tourism, Commerce and Artisanship, Francesco Morandi, said: "The biggest event in Italian sport has chosen the amazing scenery of Sardinia to celebrate its 100th edition. With the 2017 Big Start we make sure that our territory will have maximum international visibility and a very important return on investment thanks to an extraordinary initiave focused on promoting our land, its lifestyle and its sustainable growth model. The three stages on the island in May, just after Easter, will mark the opening of the tourism season and are strategic to increasing the number of tourists outside peak season as planned in the three-year period 2016-2018. This event fits perfectly with our plan, focused on active and sport tourism, building the offer through great events and new reasons to travel and visit us." 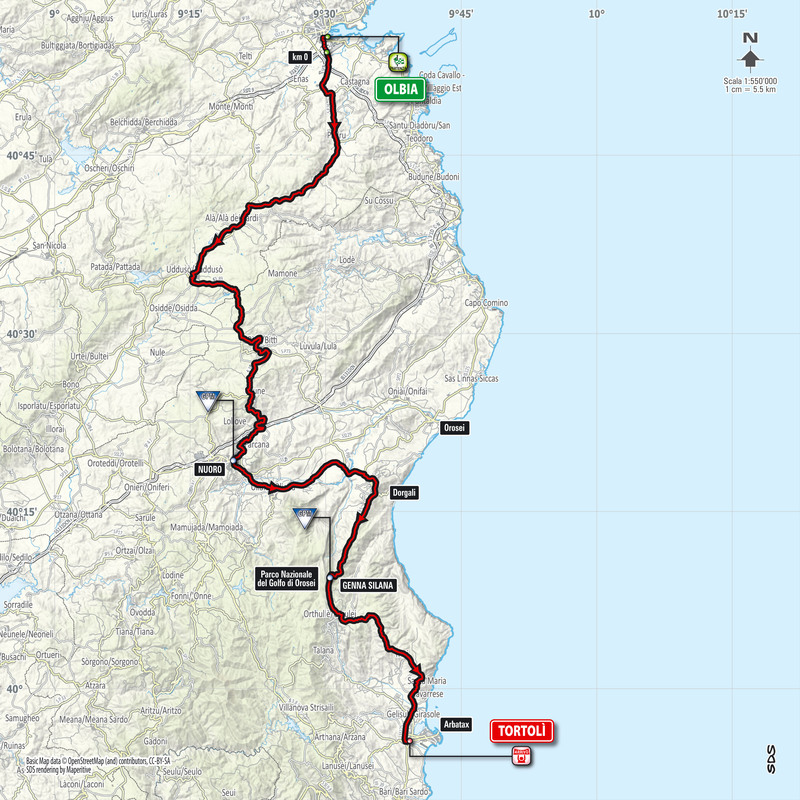 Moderately hilly stage: a constant series of up and downs along the northern coast of the island with a few KOM climbs and many other short punchy climbs. The last categorised climb, 20km before the finish line, is San Pantaleo, which could become a launch ramp for the finisseurs to anticipate the sprinters. It's a 5km climb with 3km around the average 8% inclination, the toughest section being in the first part. 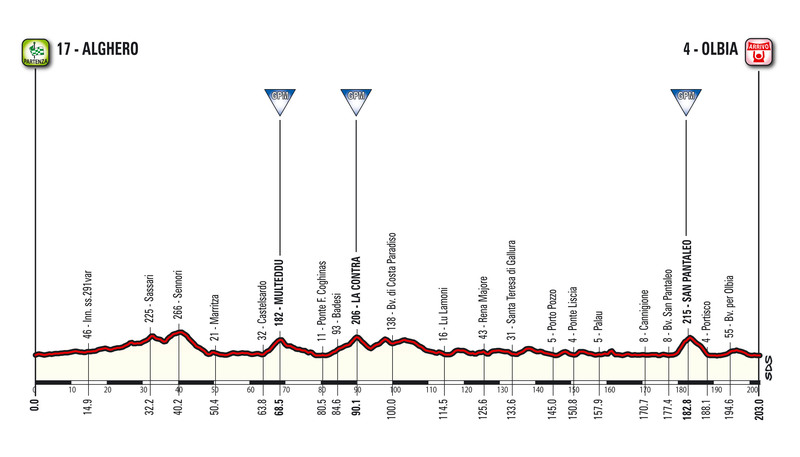 The route undulates again until the finish line in Olbia, where teams should work hard to end up in a bunch sprint. This Medium Mountain stage could end up in a bunch sprint. 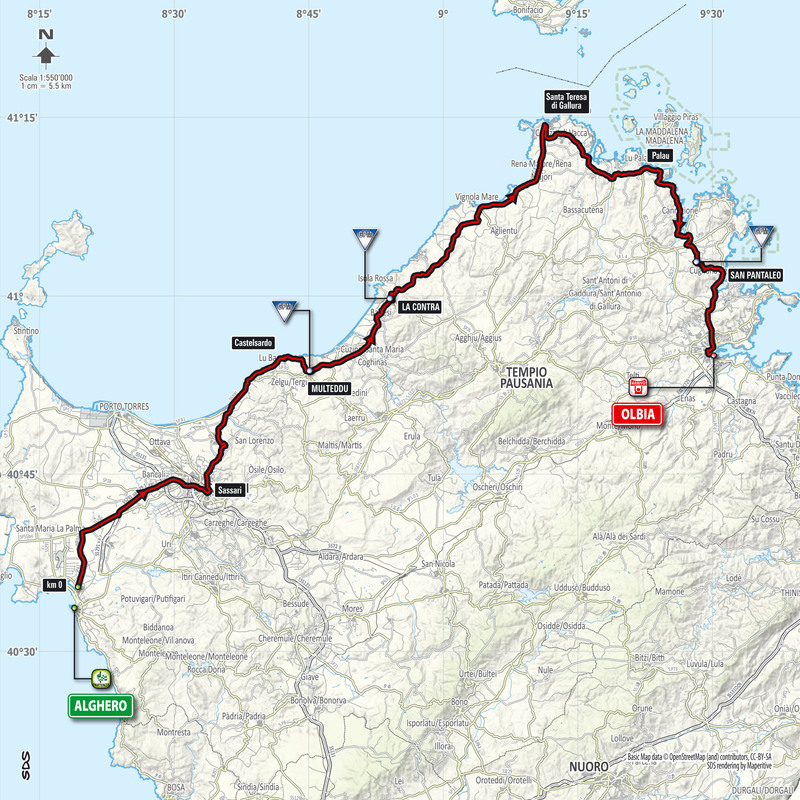 The first part of the stage is in the Nuoro region, an internal part of the island, and is characterised by three long climbs: the first toward Bitti and Orune (categorised as KOM), the second harder climb toward Nuoro city centre (KOM) and the third to overcome Genna Silana Pass (KOM). 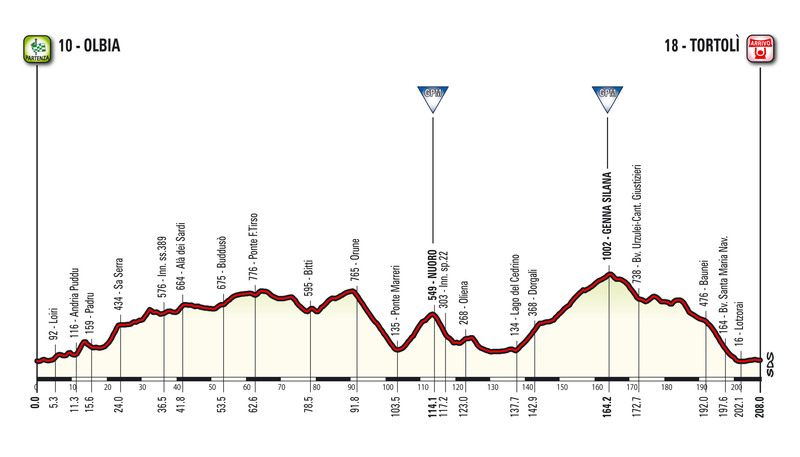 The last 50km are mostly descents or flat, but the course with many bends could create problems to close eventual gaps. Stage could end up with a sprint but this has to be conquered. This stage is almost flat with few mild hills along the course. After Villasimius there are some short punchy climbs along the coastal route. 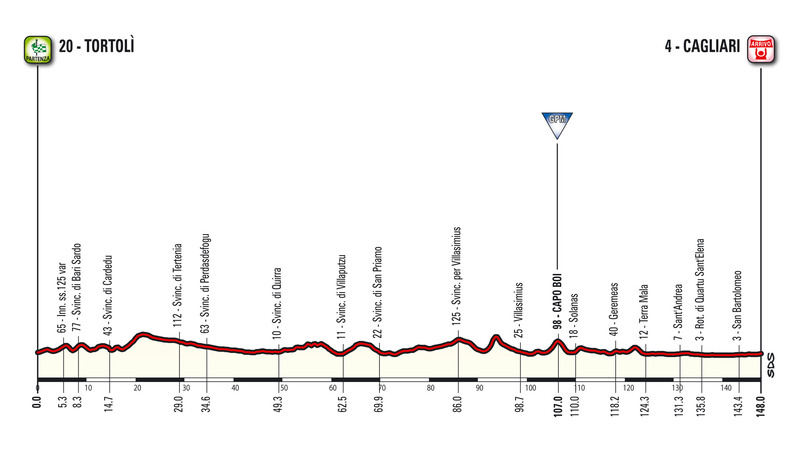 After that the road becomes flat toward the finish line in Cagliari until what's likely to be a bunch sprint.